Janine and I knew we liked to read YA literature. We also might have deduced (Barnes & Noble’s signs were pretty subtle, after all!) that a specific genre in YA had some pretty good sales. 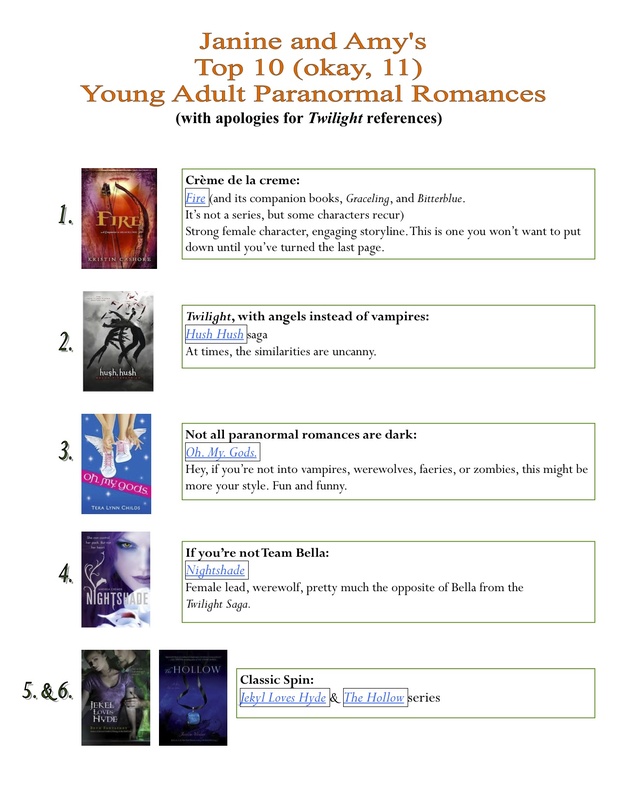 So we decided to explore Young Adult Paranormal Romances. And the best way to explore the genre: read as much as we could! We read more than 50 YA paranormal books. We noticed an interesting (and unexpected) trend: spirituality was a recurring theme in some of the YA Paranormal Romances we read. Characters were struggling with religion, were preacher’s daughters, were identifying with a particular world view. Who would have thought that teen books about vampires and zombies would also explore issues of faith? A call for proposals at a conference on “Christian Evasion of Popular Culture” seemed the perfect opportunity to focus our reading and research on the portrayals of religion in the context of YA Paranormal Romances. Three series stood out as examples of the varying degrees of incorporation of religion, and representing different paranormal perspectives: the Vampire Academy series, the Dark Divine trilogy, and the Hush Hush series. 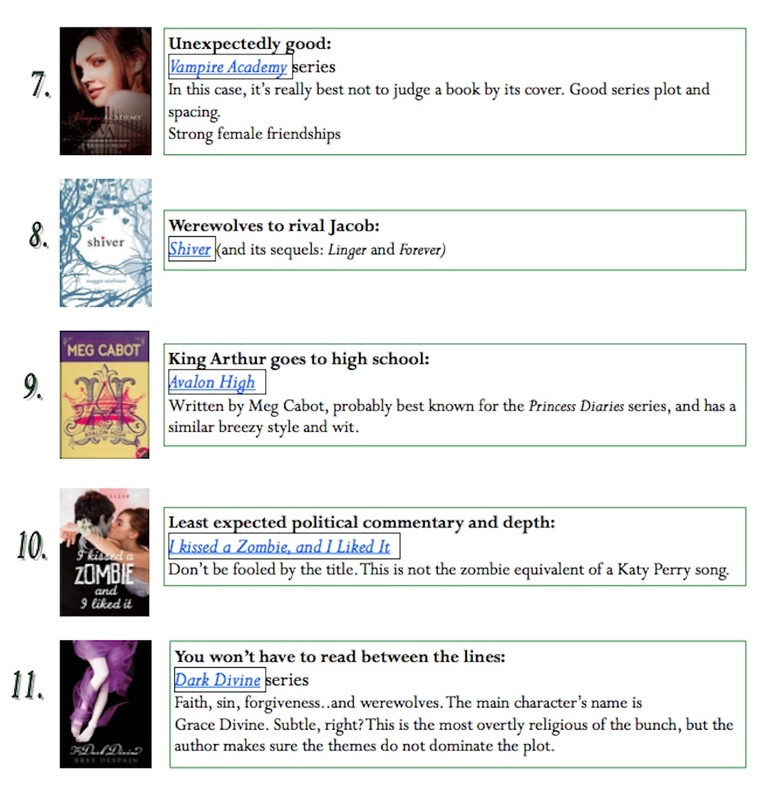 We first examined why Christians might want to avoid this genre. Em McAvan, in the Journal of Religion and Popular Culture, introduced the idea of the postmodern sacred, which we used as a springboard to talk about potential problems with a series that discusses spirituality in a way that may not line up nicely with a particular doctrine. In fact, the postmodern sacred tends to blend in a lot of different religious elements, so there really are no clearly drawn religious traditions represented. We argued, however, that these books can be conversation starters, a different way to talk about religion and spirituality than someone might talk about it in church. YA paranormal romances almost always include themes of good fighting evil. They are often coming of age stories, and one might argue that when religion is factored into the story, they also may be religious coming of age stories. Additionally, there is a theme of conversion. A person must reckon with the fact that the presence of a paranormal element defies empirical evidence. Characters must accept that not everyone is going to believe what they know to be true. Each of our three series incorporated some degree of spirituality. In Hush, Hush, the opening quote references 2 Peter 2:4 and incorporates elements of the Book of Enoch, a Jewish apocalyptic book. It references the very short part of Genesis that discusses nephilim and men procreating (Genesis 6:3-5). And it builds an entire mythology out of these small snippets. In the Vampire Academy series, the culture is Russian Orthodox, and while the main protagonist is not a believer, her two best friends are, and she comes to see the value of prayer and faith, even if there are parts of religion she can’t quite come to terms with. The Dark Divine series is set in a small town with a strong religious presence (some of the characters attend a Christian school), and the main character, Grace Divine, is a pastor’s daughter. In the series, we see how she questions her faith in the midst of the events that transpire, but ultimately views it as a source of strength. Of the three series, the Dark Divine is definitely has the most overtly religious themes, but only in service of the plot, and not as a proselytizing technique. Grace is portrayed as a real person having real doubts about her faith. She doesn’t have all the answers. She is still learning. So there you have it—research that’s fun! Think about how many YA books you can read through in a weekend, when you have no other plans—or how many YA books you can read because it’s RESEARCH, and therefore necessary and important to do instead of say, the laundry. We’re not saying all YA Paranormal Romances are great works that will transform the reader. There are still some that are better than others. But it’s also fun to do research with someone, to talk about what we’ve read, and to go through the process together. *and by the way, I found faeries to be creepy. Really, really creepy. These are no Tinkerbells (and even Tinkerbell had her dark side)! Amy C. Rice is a librarian (her actual title long and uninteresting) at Whitworth University. She holds a BA in English from Northwest Nazarene University, an MS in Library Science from Simmons College, and is currently pursuing an MA in Spiritual Formation from Northwest Nazarene University. Amy is a contributor to the Spokane Faith and Values website, where she most often writes about the intersection of religion and popular culture. She has well-known partialities for sunflower seeds, artichokes, and exotic varieties of soda (dry lavender soda? Delicious!). Janine Darragh taught high school English for twelve years in Ohio before obtaining her Ph.D. from Washington State University in Literacy and Language Education. In addition to reading YA novels, Janine enjoys eating sour gummy candies and trail running with her dog, Lancelot. Reblogged this on Horses In The Sky.